You can build your retirement savings while supporting your dependents. Providing for your dependent children doesn’t have to come at the expense of saving for retirement. 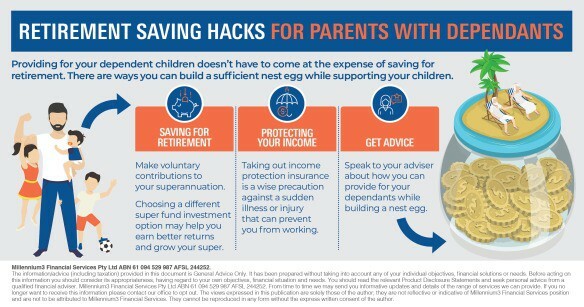 There are ways you can build a sufficient nest egg while supporting your children. Forced saving can be your ally in building your retirement fund. Making voluntary contributions to your superannuation through salary sacrifice may boost your nest egg. You can make concessional super contributions of up to $25,000 each financial year – including your employer’s super guarantee contribution. The government will tax your salary-sacrificed contributions at 15 per cent, which could be much lower than your marginal tax rate. It may also be worth looking at how and where your super fund invests your money. Choosing a different investment option may help you earn better returns and grow your super. Super can be a difficult subject to get your head around. Speak to your adviser about how you can boost your super by making voluntary contributions or changing your investment options. Your adviser can also discuss with you some retirement saving options beyond super. While you’re building your fund for old age and supporting your dependants, it’s important to protect your current income in case you’re not able to work due to an illness or injury. Taking out income protection insurance is a wise precaution against a sudden illness or injury that can prevent you from working. This policy may provide a monthly income to support you and your family during your recovery and help you stay on track with your financial commitments. It’s also crucial to ensure your dependants are looked after if you die or became seriously ill or disabled. Having life insurance, total and permanent disability cover, and trauma insurance can help you protect what’s important to you. Balancing your need to prepare for retirement and your responsibility to your dependants can be tough. But keep in mind that help is available. Speak to your adviser about how you can provide for your dependants while building a nest egg for your own comfortable retirement.